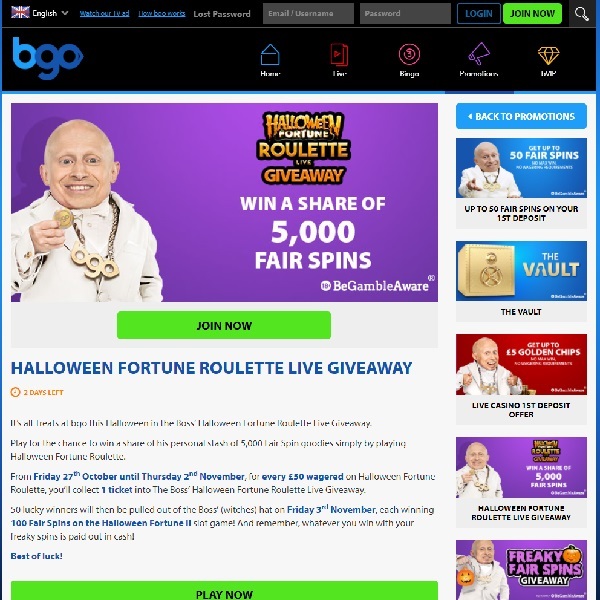 If you enjoyed Halloween parties last night and want to carry on today then head over to BGO Casino where you can enjoy the Halloween Fortune Roulette Live Giveaway. There are 5,000 free spins up for grabs. Simply head over to the casino and for every £50 you bet on Halloween Fortune Roulette before the end of the day you will earn a ticket for the Halloween Fortune Roulette Live Giveaway. There will be 50 lucky winners that will be drawn on Friday and they will each win 50 free spins on Halloween Fortune II slots. You only have a few hours left but all you need is one entry to be in with a chance of winning. Make sure you don’t miss out, head straight over to BGO Casino and set the roulette when spinning.